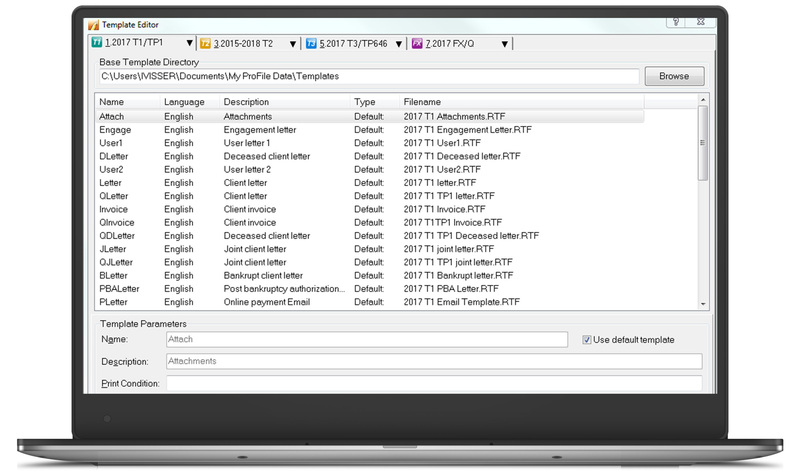 One way to further customize ProFile® is through file templates, which can be set up when certain fields contain the same data for your clients. Create a new tax return. Enter data into any field on any form. Open any forms that you want ProFile to open automatically when you create a new client file that is based on this file template. Go to the Options menu and select Module. Click the Browse button beside the File Template field, search and select the file name on your hard drive. ProFile will use the default settings in this template file whenever you create a new file of the same type, so be sure to consider which forms (and what sequence of forms) you want to see when you create a new file. For instance, if most of your clients reside in Saskatchewan you can save time by creating a template file where the province of residence is set to Saskatchewan. Note: When you carry forward past year files, information from the previous year will always overwrite any file template data. Using a template with default settings will not cause data loss during this process. Save time on your returns this tax season when you use file templates.